Waking up to our fifth day in Cuba, I noticed that being here no longer felt bizarre. The routine of waking up to Natalia cooking us a delicious breakfast and then hopping onto the bus for our day’s adventure seemed normal by now; and today’s adventure certainly did not let us down. It all started with a lecture at the CEM on student movements in Cuba. Despite our group obviously showing signs of being tired, the topic managed to captivate us and the two hours flew by. It was interesting to learn about how students just like us had managed to stand up against dictatorships and fight for what they believed was right. They put their lives on the line and many were lost because they held their beliefs above themselves. It was a very inspiring topic to learn about but we still had the whole day ahead of ourselves. After the lecture we then went off to do our organized community service work. This was an eye-opening experience that certainly changed my perspective on the privileged lives that so many of us live. While we left this community service project feeling as though we had done some good in aiding those who were much less fortunate than us, we also left with a somber and depressed feeling at what we had just witnessed. However, the day was not over yet and our next activity certainly aided in alleviating some of this sadness; even if it did result in some headaches. As Honors College students, our group has proven to have some academic prowess. Whether we are electrical engineering majors or fine arts majors, we all have obtained and maintained a certain level of excellence in our academic careers. However, today’s class proved to be something rather new and challenging for some of us. 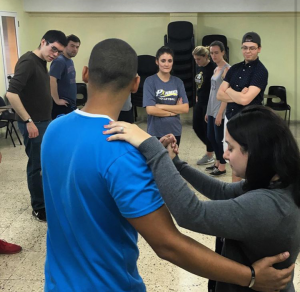 While we are used to listening to lectures and taking copious amounts of notes, being told we are going to learn how to salsa dance in class was a bit different than most of us are accustomed to. The majority of our group has really only known each other for five days at this point so being expected to salsa dance together was a little out of our comfort zones. Despite this, we were all up to the challenge and were eager to get it right. While some of us picked up the steps rather easily, the task proved to be more formidable for others of our group. Our dance teacher, Johnny, made it all look so easy and was very patient with us. While we were all able to watch him and understand what we were seeing and what he was telling us to do, it was much harder to replicate his actions than we had anticipated. Despite being honors students from the University of Massachusetts-Lowell, we found ourselves sounding childish as we slowly counted each of our steps. Even moving slowly we found ourselves messing up and, with most of us being perfectionists, this was slightly frustrating. We had to remind ourselves that practice makes perfect and repetition is key. Hours went by of doing the same basic moves over and over and slowly but surely we started to get it down and found ourselves becoming overly determined to get the moves perfect. Our dance teacher would come over and do the moves step by step with us until we would do them correctly. We finally had one pair get all of the moves right without assistance and we were all so excited by it. By the end of our session, we found ourselves much more comfortable with each other and not as embarrassed to look dumb dancing in front of each other. We left the classroom slightly tired with aching feet but in high spirits; ready to bust out our novice moves whenever and wherever the occasion calls. This experience showed us that we may not be perfect at everything but to not be afraid of trying new things and to push our boundaries. When you explore outside of your comfort zone you are able to learn a whole lot more about yourself and what you are capable of accomplishing. This entry was posted in Uncategorized by madeline_meeks@student.uml.edu. Bookmark the permalink.